For this month’s Styling the Seasons post, I wanted to keep it pale, understated and calm. As you all know, when it comes to decorating my home, I have never been, nor ever will be, minimalist. What can I say, I just love stuff! Lots of pretty, vintage stuff! I’d stack it up to the ceiling if I could! Coco Chanel once said “Before you leave the house, look in the mirror and take one thing off” and I do try to apply that rule in my home too. So, for this month’s Styling the Seasons, I did try to go for a ‘less is more’ approach, which I think reflects what I am craving in my life right now. I seem to be living life in the fast lane – crazy busy at work, making sure my children (who are growing up before my eyes) are where they are meant to be at the right time, planning and preparing for a big party I am throwing at the beginning of July (yes I’m on the precipice of turning the big Four Oh…trying not to freak out completely!!). Not only all this, but my beloved blog has moved into a different strata, and I’m embracing it fully. This blog is my baby, and I’m so excited that I’m starting to work with some amazing companies and meet some fabulous people. I feel more inspired than ever. I just need a few more hours in the day! With all this going on, I felt I needed a little area of calm and tranquility, and there is nothing like cool mint green to soothe the senses. 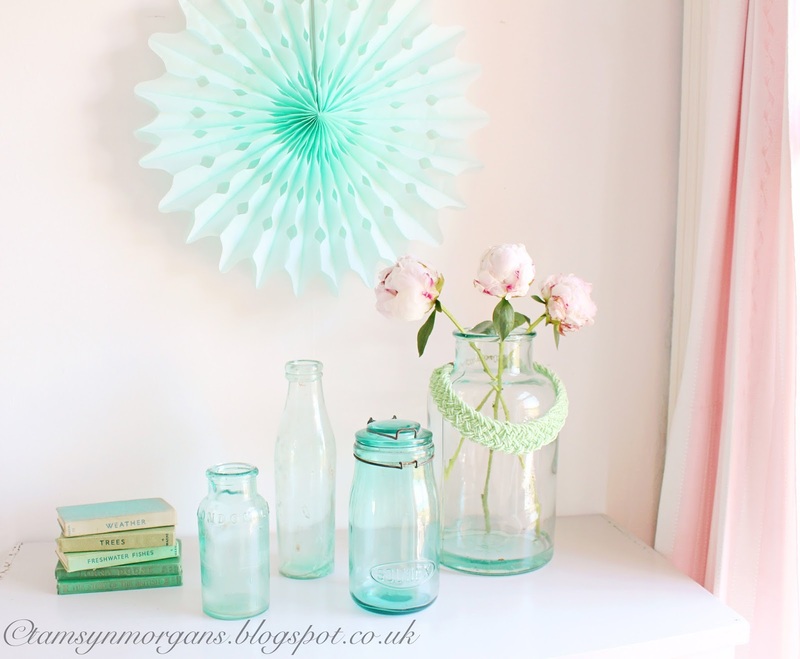 Green glass is easy enough to find by hunting at car boot fairs, but I did buy the big beautiful jar from The Old Haberdashery, a treasure trove of gorgeous vintage finds in Ticehurst, East Sussex, which is where my parents live. Sonia has a real eye for the unusual, has the most beautiful window displays, and is absolutely lovely, it’s always a joy to catch up with her when I’m visiting my folks. Plus I always leave with a bag of vintage treasure! She usually has a few of these jars in stock, often filled with cotton reels or other pretties. As always you can see lots of other beautiful and inspiring Styling The Seasons posts by heading over to Katy’s blog Apartment Apothecary and Charlotte at Lotts and Lots, or by searching the hashtag #StylingTheSeasons on Instagram. You can also join in on Instagram by styling a surface in your home according to what that month means to you (don’t forget to use the hashtag!). Such beautiful colors! I love the look of the green glass – how it creates shape and color, yet gives an airy uncluttered vibe. 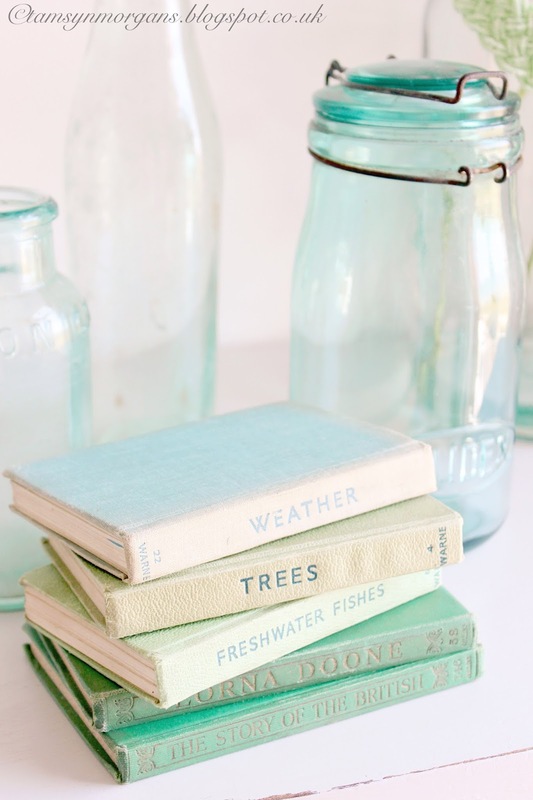 The little vintage books are adorable – I can imagine how fun it is to page through those! 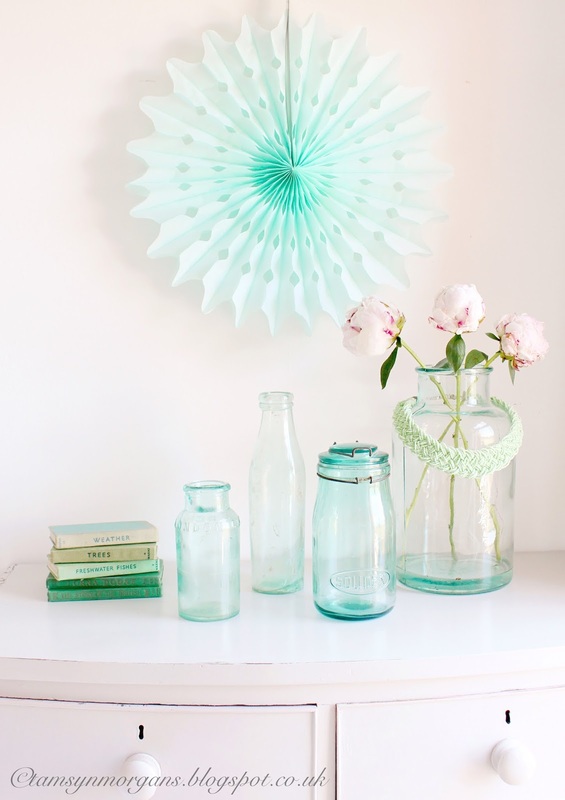 And I'm fond of pairing vintage and new items together like you did here, adding that fun paper fan. I had not thought of using those as a decorative element other than for a party! 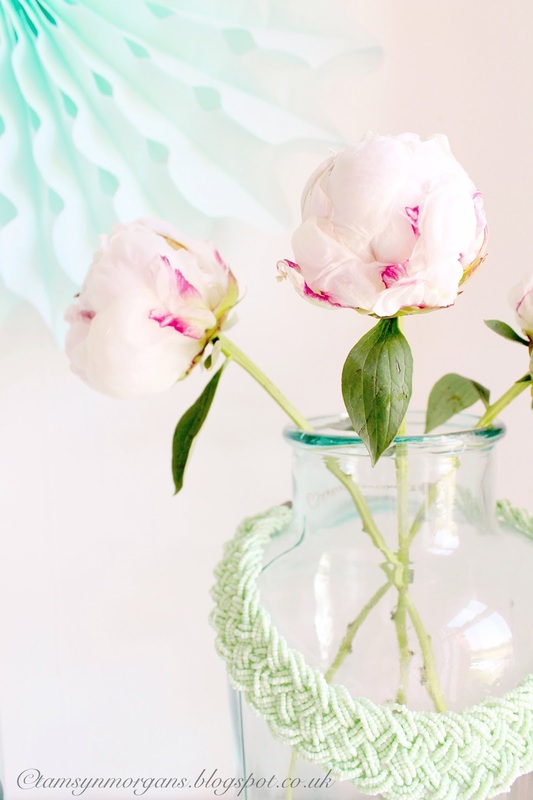 And those peonies – be still my heart! So pretty! WHAT??? How is it even possible that you are 30 yet? Seriously!! !